In order to record mixer automation, you need to assign a sequencer track to the mixer. Mixer automation lets you create more dynamic mixes, but also provides a fast alternative to arranging all your tracks in the sequencer. We offer a simple guide to making the most of it. Like most of the heavyweight sequencing environments, Reason allows you to record, edit, and play back control movements made on its mixer (or mixers). There are many reasons for wanting to do this, such as riding the levels of instruments to 'even out' volume changes and to allow different parts to take prominence during the song. Automating effect send levels is also common, as is creating a fade-out by automating the master fader. Reason 's fast and straightforward automation system also makes it simple to use as a compositional tool: mixer automation is sometimes a faster and more spontaneous method of arranging parts of your songs. If you use a sequencer package such as Logic or Pro Tools, you'll probably be aware that your mixer page has a dedicated system for automation. These systems are akin to automation on professional hardware mixing consoles, allowing you to put individual tracks into various automation modes. This type of automation system is different to using MIDI Continuous Controller (CC) data, which is traditionally used to control parameters on MIDI synths, but can also be used to automate software synths and sometimes mixer parameters. In Reason, automation is MIDI Controller data, but with some specialised tools for handling the data and playing it back. Every instrument and device in Reason, including the mixers, is treated like a separate MIDI module, and most parameters can respond to MIDI controller data, either from an external source or from the built-in sequencer. If a device's MIDI track is record-enabled in the sequencer and Reason is recording, any control changes made on the device (with a MIDI controller or the mouse) are recorded on that device's track. In the next section we'll go through this step by step. Each sequencer track has many 'sub-tracks', called Controller Lanes, allowing control changes for each parameter on a device to be displayed separately. As automation in Reason is MIDI CC data, it must be recorded on a sequencer track. When you create an instrument in Reason, a sequencer track is provided for it automatically. This doesn't happen with other devices, such as mixers and effects, so before you can automate the mixer you must create a track for it. For the purposes of this article, we're considering a song with one Remix 14-channel mixer, but you can automate multiple mixers using multiple sequencer tracks. Automated controls are indicated by green boxes. 1. 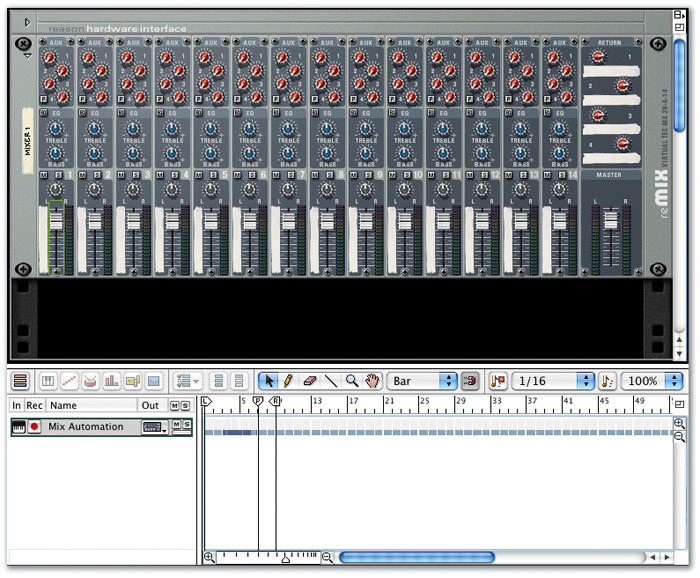 Go to the Create menu and choose Sequencer Track; a new track will appear in the sequencer. 2. Next, from the pop-up menu to the right of the track's name, choose the Remix mixer as the Out destination (see the screen above). 3. Change the name of the track to Mix Automation and you're ready to try recording some automation. The new track is already record-enabled, as indicated by the red circle to the left of the track name. 4. 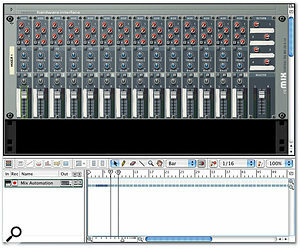 Start Reason recording by clicking Record, then Play, then use the mouse to move fader one up and down a few times. 5. After you stop playback, you'll see two indications that some automation was recorded. 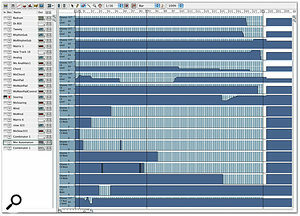 Firstly, there will be pale-blue blocks running the length of the sequencer track, with darker blue areas showing where there is automation activity. Secondly, a green box will have appeared around the fader that is now automated (see screen, right). 6. Now return the sequencer to the start and play through what you recorded: you'll see the fader retrace the movements you recorded. That's all there is to it. The next step is to view the automation data in more detail. There are a number of buttons and menus in the sequencer toolbar that govern how controller data is viewed, but there's a shortcut if you just want to jump straight to a particular parameter: option-click (Mac) or Alt-click (Windows) on the fader you automated. The sequencer will switch to viewing the controller lane for the fader and you'll see a graph representing the movements you recorded (see screen below). The screen shows the view controls for automation, with labels for what each button or menu does. The rightmost button is usually the most useful, allowing you to display all the automated parameters on that device, leaving un-automated controls hidden. However, if you have a large number of automated controls, you may wish to use the pop-up menu to select exactly which automation graphs are displayed (see top screen overleaf). Notice that parameters that have been automated are indicated by an asterisk in the list. Reason 's Keyboard Control functionality is ideal for recording mute automation, as it makes it possible to toggle more than one mute at a time. 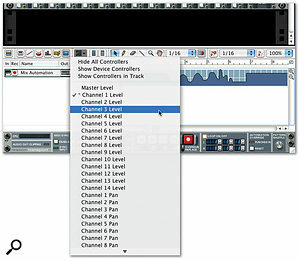 Assigning computer keys to mute buttons overcomes the limitations of recording automation with the mouse.1. 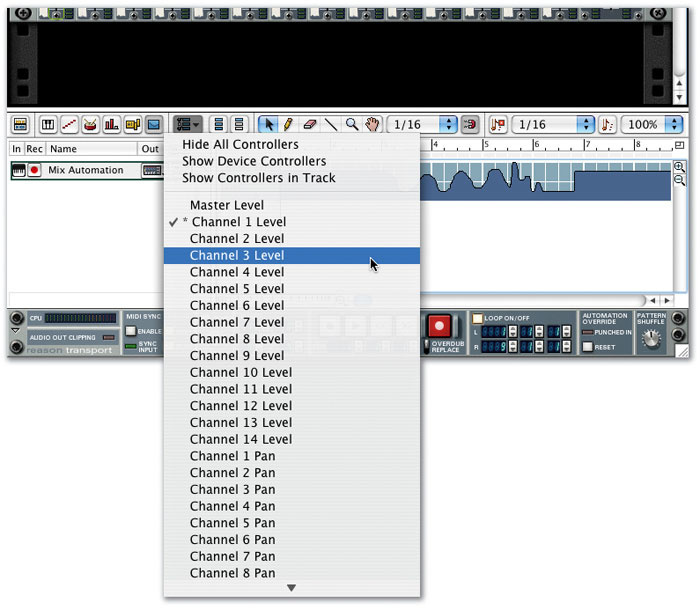 Select the mixer and choose Keyboard Control Edit Mode from the Options menu. The on-screen rack will become greyed out and yellow arrows will appear over all the controls. 2. Double-click the first mute button and the arrow will spin. Pressing a key on the computer keyboard will map that key to the mute button. 3. Repeat this procedure for each mute. If you start with the numerical keys, you should be able to get 12 mutes mapped on one row. 4. Exit the mapping mode by selecting it again from the menu. 5. Finally, choose Enable Keyboard Control from the same menu. The key to viewing just the automation data you need to see is the group of four buttons labelled above. 1. With your Mix Automation track record-enabled, go into record over the section of automation you wrote earlier. The fader still follows the existing automation. 2. Grab the fader and automation will immediately begin recording over the top of what was there before. 3. Let go of the fader. It will stay where it is put, and a straight-line automation graph will be written to the Controller lane until you hit Stop. Alternatively, you can punch out of Record or hit the Reset button. Automation writing will stop, after which the fader will return to following the existing automation. If you're familiar with Logic, Pro Tools or certain mixing consoles, you'll recognise this as an Auto Latch mode with a Snap Back facility. Anyone familiar with latched automation writing will also be aware of a potential hazard. You can also see the problem in the graph in the screenshot below. At the point where you stop recording, there's a good chance that you'll end up with a sudden jump in the automation graph, as the fader (for example) returns to its initial setting. Some automation systems (again, Pro Tools is an example) offer a 'Write To End' or 'Write to Next' function that lets you write flat automation to the end of the song or the next event when you stop recording. With Reason, you either need to play all the way through the song, so that the correct positions of your faders are written throughout, or take care of the problem later with editing. Fortunately, taking the editing route is very simple. All you need to do is select the Eraser tool, click just before the point where you stopped recording, and drag to the right up to the end of the song, or however long you wish the control to stay in the same position. The level at the point you clicked will be extended throughout the selection. In the screen on the opposite page you can see that I've used this trick to extend the automation on several faders and mute buttons to the end of the song, so I didn't have to record all the way to the end. The Automation view menu lets you pick and choose which parameters are displayed.When creating a song in Reason, it's common practice to try out a few arrangement ideas by running all tracks as loops and bringing parts in and out by 'playing' the mute buttons on the mixer. When I first started using Reason, I was having too much fun layering up synths controlled by Matrix step sequencers and running drums from Redrum 's built-in sequencer to learn how to use the main sequencer. Instead, I would create quick arrangements by automating mutes and faders. Going through some of these old songs, such as the one in the screen on the opposite page, reminded me how quick and fun this was, so I've returned to doing it for some tracks. It's especially useful for ambient songs. The ideal is if you have a MIDI controller box that can control the mixer, because you can then do more than one thing at a time, but it's not essential (see the box below for a way of using the computer keyboard to control mutes). 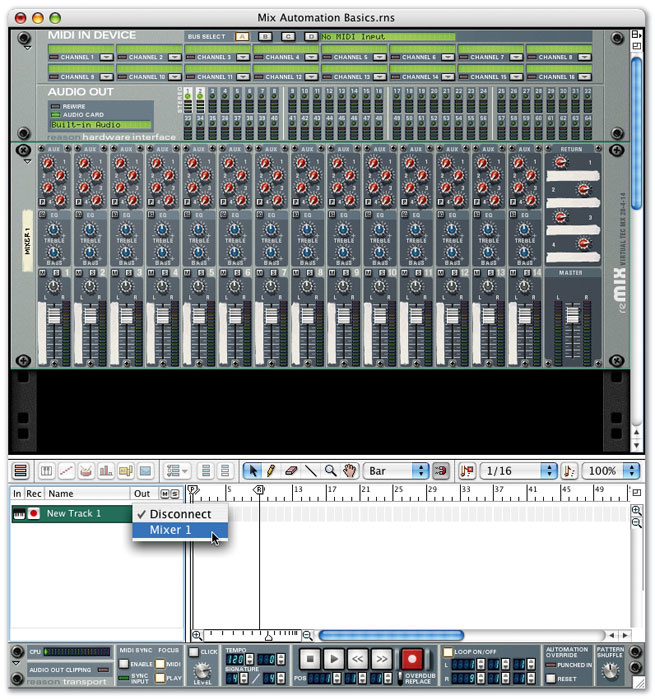 The track shown in the screenshot was made on a laptop with no MIDI controllers or keyboard attached. First, you should run through the track a few times, experimenting with bringing in tracks with the mutes, until you've come up with a nice arrangement. You can then record this as automation data. First, set up the mixer so that it's in the correct state for the start of the song: everything should be muted except the tracks that will play from the very start, or tracks that start with their faders all the way down. Now, after making sure Loop mode is off, go into record and perform the mutes you rehearsed. If you're using the mouse, you may need to perform multiple passes when several tracks come in or are cut out at the same time. However, don't worry too much about getting everything perfect — you'll need to do some cleaning up afterwards anyway. Unfortunately, Record Quantisation only works for notes in Reason, otherwise you'd be able to make sure all your mute presses were recorded exactly on the bar. As this is not possible, there will be some tracks that are cut off too sharply, or that click when you mute or unmute, and these will need tidying up in the sequencer. A complete song arrangement created using mute and fader automation.Also, an alternative to doing multiple passes is to just get the automation somewhere close and fix it up afterwards with editing. To see your automation graphs, select the Mix Automation track and click the Show Controllers in Track button (the button that only displays automated parameters). 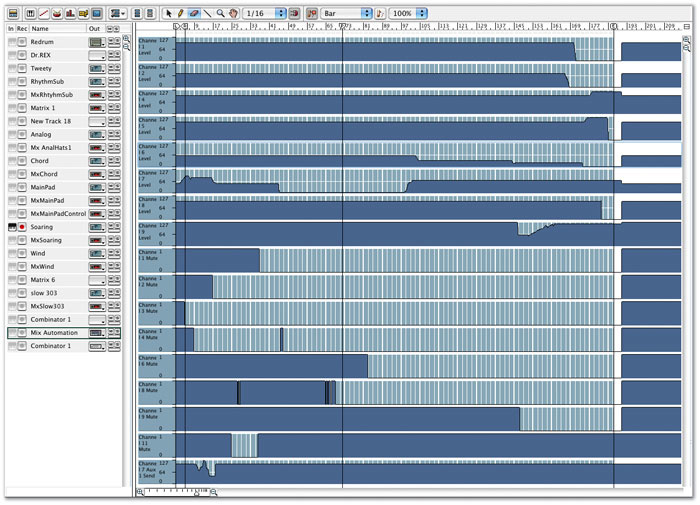 Set the edit grid to Bars and use the Pencil tool to trim any rough-sounding mutes. When your mutes are finished, you can go in and record fader movements for tracks that fade in or out of the arrangement. You can also emphasise some parts and pull others back at different places to create movement in the mix. If the song fades out, you can do this with the master fader at the end of the track. This method is so simple because everything is achieved using one device and one sequencer track. Obviously, it isn't appropriate for all songs, but can be used as a starting point, and may be quicker and more 'musical' than dragging around notes and groups in the sequencer. More complex arrangements can be made by extending the same idea to automating mutes and levels on the Redrum drum machine. Further variety can be added by automating pattern changes on your Matrix sequencers and Redrum. By the time you come to the stage where you need to start editing in the sequencer, you'll find that the main structure of your song is in place, which is much less daunting than trying to construct it from scratch.